The Stylus is the ultimate in convenience - a Stylus and Ballpoint pen in one. 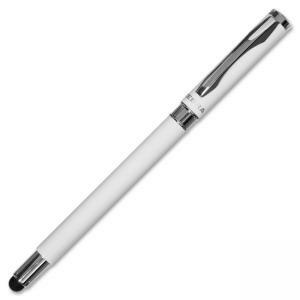 The refillable ballpoint pen with a thick capped barrel gives you everything you would expect in a Zebra pen with both quality, comfort, and an enjoyable writing experience. The cap attaches over the stylus when the pen is in use. Touch-screen compatible stylus is designed for performance and precision and makes it easy to work on your iPad or Tablet. Stylus has a broader point for sketching broader marks. Medium pen point (1.0 mm) delivers ultra-smooth, low-viscosity black ink. Design also includes a lacquered metal barrel with metal accents for a sleek, sophisticated look.